The AIE-664HS (formerly AIE-DH3) is an electric auto imprinter. The AIE-664HS will print one, two or three lines of up to 14 numbers/letters and comes with 3 each of numbers 0-9 and 2 each of "Exp", "Lot" & "Date". Letters A-Z are available individually. An electronic eye activates the unit when the material to be printed is placed beneath it or use the foot pedal for manual operation. No compressor required with this electronically controlled imprinter. Printing tape and type is included, and this machine uses the 30mm ribbons. 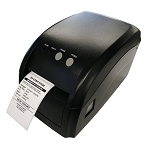 Be sure to order INKTAPE3 ribbons for this imprinter.